How do you invent your own archetype? the default setting on the identity of self. We are here to invent ourselves. with such an infinite palette of becoming. needed to move ourselves into a new terrain of being. I am writing today to tell you about our upcoming course, LEGEND: Archetype. An invitation to begin living your legend. I have been working for over twenty years with thousands of women and girls on healing from shame, recovering from abuse, finding their voices and gathering their fragmented selves into wholeness. What our research has discovered about how to heal ourselves is consistent across the board. To heal ourselves we have to heal our story. Easier said than done. We all know that. But how does it work? So we began to experiment with how it could be done….through intentional creativity. IN our research we found when we look at the story or wound directly – our vision wasn’t clear in terms of what path to take, but when we looked with inside eyes, the eyes of our of hidden mystic self – we saw a completely different landscape of what was possible – bringing idea into ‘form’ made that possible. i.e. committing art, as our Art Matriarch was fond of saying. This happened through the process of making an epic painting associated with our identity. A painting and re-invention our story…. based on what the painting revealed. The journey showed women what they could not see with ordinary eyes. They needed another way to view the vast unconscious domains held within them and it turns out, yep, art is one of the most direct ways of making that happen. But we don’t need to be the wounded walking to benefit from this work – it is for ANYONE who is ready to CHANGE UP the way they have been living their lives – and are ready to author their future with creative intelligence showing them where to go. The development of this materials isn’t my own, it has been a result of a community effort, that community is called Cosmic Cowgirls and my family and specifically Jena Owen and Mary MacDonald. 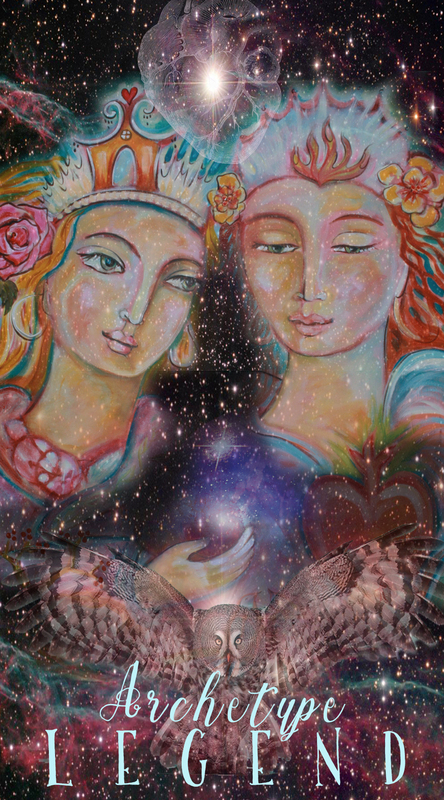 Cosmic Cowgirls is an archetype that brings worlds together within women – parts of us we lost, coming back together with the parts of us that long to love, serve, and be our most authentic selves. When we live from our wildest truest selves we can find the peace, joy and pleasure of being incarnate in a body at this time…. yes it is possible and it all about identity. We who see ourselves as, therefore how we show up and the lives and relationships we create – and our orientation to the universe. This offering is near and dear to my heart and is indeed at the heart of my soul work and the deep creative work of the Cosmic Cowgirls. This is the last LEGEND on the books until the Fall of 2016 – so I hope you will consider joining us. The journey will be guided from Cosmic Cowgirls with my dear friends, Mary and Amber. Intrigued – come see what I am talking about here.